the noise of everyday life to recenter on God. Two commands He gives to us: Love God, and Love others. to apply these commands to our lives. Where at? In Tygh Valley, Oregon! We’ll head to Camp Morrow, about 2 hours SE of Portland. When do I leave? We will meet at EBC on Friday, Feb. 15th at 4:00 pm, aiming to leave by 5:00 pm. How do I get home? You will be safely transported back to EBC around 3:00 pm on Monday, February 18th. Why should I go? Because it’s important to take time to get away, refocus on God, and fellowship with brothers and sisters in Christ. We’ll see God in the scriptures, worship Him with our voices, and learn to treasure each other as God intended. While on retreat, we’ll enjoy tubing on mount hood, night games, snowball fights, and great food. The real question is, why would you stay home? Signups close on Sunday, Feb. 10th. A small discount is applied if signed up before Feb. 1st. Scholarships are available! Contact Luke Jech, or Ryan Aufenkamp for more information. 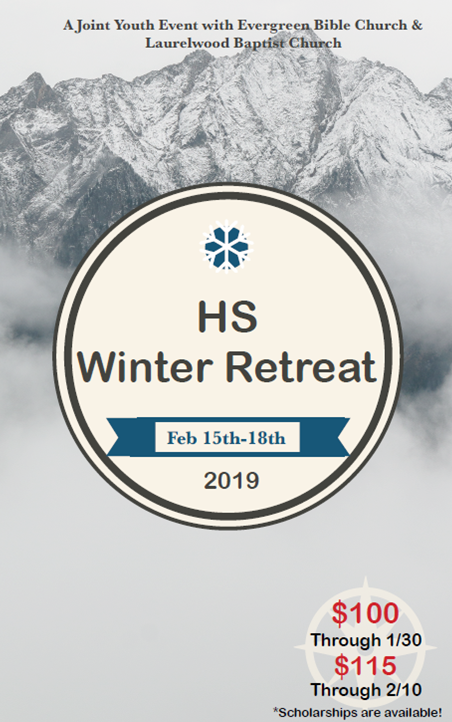 HS Packing List: Bible & pen, warm/comfy clothes for around camp, snow clothes (snow pants, jacket, boots, gloves, hat), toiletries and towel, sleeping bag & pillow. 9600 E Mill Plain Blvd. Permission is hereby granted for the above named person(s) to participate in the events sponsored by Evergreen Bible Church for the duration of the time listed above. In case of accident or injury, permission is granted for medical treatment to be administered, as needed. I/we acknowledge that, in the event of injury or accident, our own medical insurance takes priority. In the case that I/we are not adequately insured in the case of injury or accident, I/we agree personally to assume the risk for ourselves and our family. I/we agree to come transport my child(ren) home if they disqualify themselves from any event. Disqualification may occur if my child commits a major violation such as inappropriate sexual conduct, possession and/or use of tobacco, alcohol, or illegal substances, or unwillingness to follow instructions of the youth leader in charge. The youth leader in charge will determine if disqualification is necessary. PLEASE SIGN BELOW WITH YOUR MOUSE OR ON YOUR TOUCH SCREEN. BY ACKNOWLEDGING AND SUBMITTING THE FORM BELOW, I AM DELIVERING AN ELECTRONIC SIGNATURE THAT WILL HAVE THE SAME EFFECT AS AN ORIGINAL MANUAL PAPER SIGNATURE. THE ELECTRONIC SIGNATURE WILL BE EQUALLY AS BINDING AS AN ORIGINAL MANUAL PAPER SIGNATURE. Payment for students is due upon registration. CASH OR CHECK PAYMENT. Bring or mail payment to EBC (Evergreen Bible Church, 9600 E. Mill Plain Blvd., Vancouver, WA 98664). If paying with cash or check, make sure quantity below is 0. If paying with credit card, select quantity depending on number of students you are registering.